Recent researches have also found that platelets release some kind of healing proteins known as growth factors to accelerate tissue repairing and wound healing. Once the concentration of platelets is increased in the blood by any method, it can lead to a faster mechanism of tissue restoration. The Platelet Rich Plasma Therapy is used in humans as a clinical tool for several kinds of medical treatments like cardiac muscle injury, nerve injury, osteoarthritis, bone repair and regeneration, oral surgery, tendinitis, plastic surgery, etc. It has been widely used for treatment of sports injuries in athletes. PRP is basically an amalgam of multiple proteins which collectively activate repair and regeneration processes. There are even a few proteins in PRP which can now be isolate for pain reduction and to enhance anti-inflammatory effects. Various natural, as well as homeopathic tools have been developed by the scientists to selectively separate the cells, or growth factors from the PRP to meet the selective needs of treatment in special cases which involve either faster repairing, or more pain reductions. Presently, two methods of PRP preparations have been approved by the U.S. Food and Drug Administration. Both the methods involve collection of whole blood cells, Anticoagulation with Citrate dextrose, before it goes through the two stages of centrifugation, drafted to separate the PRP aliquot from the platelet poor plasma, and RBCs. Blood platelet count is brought to up to five times higher as compared to normal blood platelet count using the strategy of PRP. PRP was initially being used in the Dental community, about 20 years ago, to improve cancer healing abilities in the jaws of the patient under reconstruction. After that, the application grew wider and covered several aspects of cardiovascular as orthopedics treatment. 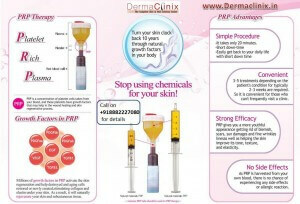 We, at DermaClinix, have best prp doctor in Delhi NCR with extensive experience in this field, and after years of research, we have been able to develop balanced PRPs to help our patients achieve the right amount of different compounds. We provide high quality PRP treatment in Delhi to our patients to give promising results, without any kinds of inconsistencies. PRP therapy might still be in early stages of development, but it has revolutionized the process of injury recovery in human body, and the power of this therapy cannot be underestimated. We take utmost care of the patient while dealing with such techniques, and understand how critical it is for a patient to make a quick healthy recovery. Visit us at our clinic or contact us to book an appointment with our specialized dermatologists.